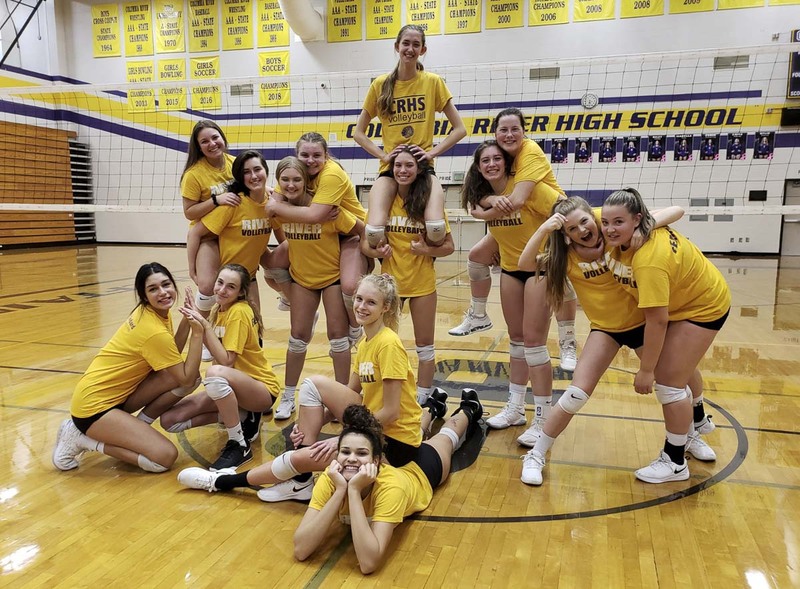 VANCOUVER — They have had a theme all along, but now the Columbia River Chieftains have a new goal this volleyball season. The theme: The Chieftains want fearless volleyball players who improve daily. The outdated goal used to be to get to state. That was erased and replaced on the whiteboard, though. Now, it is to win state. After some early season struggles, the Chieftains are peaking at the right time. The third-place team from the Class 2A Greater St. Helens League avenged regular-season losses to Ridgefield and Woodland to win the District 4 tournament last week and head to the WIAA state tournament as the district’s top seed. Don’t feel too bad for Ridgefield and Woodland, though. The Spudders and Beavers are also going to state as the 2A GSHL took all three berths from the district. Still, it might have been a shock to some to see that Columbia River finish at the top at district. The Chieftains went 8-4 in league play, losing two matches each to league-champion Ridgefield and runner-up Woodland. “We did that by playing for each other, really,” senior Lexi Williams said. “Once we said, ‘I’m playing for you, and I’m playing for you’ and everyone took care of their jobs, it brought us together,” added senior Alicia Wallingford. After every practice, the team huddles and every player names one thing she did to better herself on the court that day and praises one thing a teammate accomplished. All of that positive reinforcement helped, Williams and Wallingford, the two captains, said. The Chieftains did get better throughout the season, and it led to the success at district. It is all about aiming higher, she added. Not just on the court. Columbia River coach Breanne Smedley said the emphasis on team culture and trust really kicked in after some “bumps” early in the season. The team had to start again with the basics. The Chieftains knew they were getting closer to clicking when they took Ridgefield to five sets in the final match of the regular season. At district, the Chieftains beat Black Hills in the opening round, then beat the Spudders in the semifinals, clinching a spot to state. Wallingford did say it was a “finally” moment, but not just from beating Ridgefield. It was all the video study, all the preparation, and the belief that it could be done. “Finally, we see it come to fruition,” she said. That victory sent the Chieftains to the district title match against Woodland. “Our work wasn’t done,” Williams said, and the focus quickly turned to winning the tournament. The pressure was off at that point, Wallingford noted, because the team had already secured a trip to state. They have the same philosophy going into state. The recent past has shown that any team that makes it out of District 4 has the potential to play for a state title. Which is why Columbia River’s changed its goal. A state championship is possible. Win state is now on the whiteboard. In all, there are six teams from the region that are going to small-school state tournaments. As noted, Woodland and Ridgefield are joining Columbia River in the 2A state tournament at St. Martins University in Lacey. La Center and King’s Way Christian are playing in the 1A tournament in Yakima. Firm Foundation of Battle Ground made it to the 1B tournament, also in Yakima. Columbia River faces Kingston at 9 a.m. Friday in the opening round of the 2A tourney. Ridgefield takes on Pullman, also at 9 a.m. Woodland is facing North Kitsap at 11 a.m. The quarterfinals will be Friday, while semifinals and finals are set for Saturday. In the 1A tourney, La Center plays La Salle at 5:15 p.m. Friday. King’s Way Christian has a 3:15 p.m. match against Granger. Firm Foundation plays Shoreline Christian at 1:30 p.m. Thursday. The Class 4A and 3A state tournaments are in Yakima on Nov. 16-17. Camas has already clinched a trip to state and will be playing in the final four of the bi-district tournament Saturday at Kentlake High School. Union and Skyview are in the consolation bracket of the bi-district tournament. They play each other Saturday in a loser-out match. The winner would then have two matches to win one to make it to state. Prairie has already clinched a trip to the 3A state tournament. The Falcons are playing in the final four of the bi-district tournament Saturday at Capital High School. Mountain View is in the consolation bracket and must win three in a row Saturday at Bonney Lake High School.